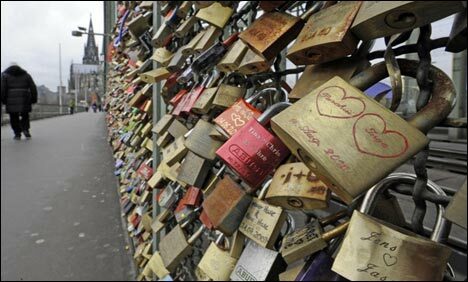 BERLIN: German police caught two thieves breaking open "lovers' padlocks" attached to a bridge over the Rhine River in the city of Cologne. The pair were cutting padlocks, left by amorous couples to symbolize their eternal love, off a railing on the Hohenzollern Bridge presumably to sell as scrap metal, police said. "I spotted two men on the other side of the bridge tampering with the lovers' padlocks, so I called for back-up straight away," a police officer said. The men tried to escape with their loot after spotting police but were apprehended on the bridge. Police discovered over 50 padlocks along with lock cutters in a trolley suitcase, wheeled along by the men. The pair will appear in court on charges of property damage, police said.